Parks & Rec: Kenner’s Newest Parks! Kenner is upping its game with a new dog park and skate park, plus plenty of playgrounds for the kids. Get the scoop below! Dogs in Kenner had it “ruff” without any designated city dog park. But it’s official — Kenner City Park has started phase one of construction on a brand-new, dedicated dog park. The dog park will be one of only three others in Jefferson Parish (besides ones at our properties like Bella Ridge, of course). Dogs and their pet parents will love this fully fenced park, featuring watering stations, benches, lush landscaping, and fun, decorated fire hydrants scattered throughout its expansive grounds. Once the park is complete, it will feature three areas for different types of dogs, including an area for small dogs, one for large, passive dogs, and another for large, active dogs. Planners say they also hope to include agility equipment, a splash pad, and a memorial brick paw walkway. The dog park isn’t all that’s coming to Kenner City Park, either. Just-announced plans for a 2,400-square-foot synthetic ice skating rink for the expanded Christmas Village mean that plenty of fun is available for humans, too! Skateboarders will (kick) flip over Kenner’s new Wentwood Skate Plaza at 200 W. Loyola Drive. Clocking in at 2,400 square feet, the state-of-the-art skate park is the first of its kind in Jefferson Parish. The park is open daily from 10 a.m. until dusk with the potential for expanded hours after new lighting is added. Kenner Mayor Ben Zahn notes that the skate plaza spotlights Kenner’s commitment to outdoor spaces. “The timely opening for our youth to have another recreational attraction with summer right around the corner is perfect for all Kenner residents to enjoy,” Zahn told NOLA.com. Families can enjoy Kenner’s wide variety of parks and playgrounds, including Woodlake Playground on Esplanade Avenue. This spacious spot features recreation leagues for soccer, football, baseball, volleyball, cheerleading, track, and more. Plus, clean, well-maintained play equipment like slides and swings are great for the little ones. Other great Kenner playgrounds include those at Kenner City Park and the Lions Playground on Williams Boulevard. Take a look at all our convenient Kenner properties — plus, they’re dog friendly! Here are a five ways to keep your space clean and inviting while living with feline roommates. Wipe down counters and surfaces. Cats are avid athletes, and they’re not too mindful of those “no pets on furniture” rules. It’s easy for most cats to jump on high furniture and surfaces, meaning their paws have been just about everywhere – including your kitchen counters. Because cats use the litter box, you certainly don’t want any lingering debris or germs in any food prep areas. Get in the habit of wiping down your kitchen counters before and after meal prep for a clean slate. Brush your cat regularly. The benefit here is twofold. Although cats are superb self-groomers, they can suffer from hairballs as a result. If you take time each day or a few times a week to gently brush your cat, you’ll reduce the risk of hairballs and help mitigate excess fur that can end up on your furniture and in your home. Win, win! Our hands-down favorite tool is the Furminator brush, which works wonders for both shorthair and longhair cats. Choose furniture wisely. Many animal professionals agree that declawing your cat is not humane. If your cat has its claws, however, your furniture can become a prime target! Try to avoid materials and fabrics that are more palatable to your cat like wicker or basic upholstery. Instead, opt for leather, treated wood, or metal. If new furniture isn’t an option, you can create your own natural, safe “cat repellant” spray to help discourage them from clawing. Simply mix a few drops of 100% orange essential oil into a spray bottle with water and spray your furniture generously. Most cats don’t like the smell of citrus and will steer clear! And remember, scratch pads are a great way to redirect your cat to a safe scratching zone. Vacuum at least once per week. Even if you brush your cat regularly, you’ll still want to vacuum at least once per week to mitigate fur and litter debris. You might consider investing in a handheld vacuum to clean up targeted areas with ease, like Fluffy’s favorite chair or the litter box area. About that litter box… Aim to place your cat’s litter box in a private, infrequently used area like a spare bathroom or closet space. Ideally, choose a space with tile or hardwood as opposed to carpet. Clean your cat’s litter box at least once a day – and remember, the longer waste sits in a litter box, the more likely it is to smell. Keep helpful tools at arm’s length, including plastic bags to clean up the waste and a small broom or handheld vacuum to remove any excess litter that may have fallen onto the ground. You can also put a mat or old towel underneath the litter box to help prevent your cat from tracking it into other parts of the house. For more pet tips, visit our Living with Pets posts on the blog! Dogs are family. It’s just that they shed a whole lot more than our human family. Dogs bring us so much love and light in our lives, but they also require a little extra cleaning at home. Read on for tips on how to maintain a picture-perfect apartment, even when you’ve got a four-legged friend or two. Keep washable mats at each door: You might have a welcome mat outside the front door, but consider placing one just inside the door as well. This simple addition can help tamp down dirt and mud that dogs might track in. Remember to add mats both inside and outside any additional doors, as well. And remember to choose a washable mat! Groom and bathe your dog regularly: Frequent bathing and grooming is one of the best ways to limit dog hair and dander inside your home. Try to brush your dog every day (preferably outside) to loosen and remove any dirt or shedding fur. Another great habit is to wipe your dog’s paws after a walk or trip to the dog park. Keep scrolling for one of our favorite products to tackle the job! Clean up accidents ASAP: Accidents happen, and even though it can be frustrating and you might just want to ignore it for a little bit, you’ll be a lot better off to stop what you’re doing and clean things up. The longer dog urine sits, the more likely it is to permanently stain (and stink!). If it’s a, um, solid situation, remove any residue with a dull knife. Then, blot fresh stains with a cloth and apply lukewarm water mixed with a drop of dish soap. Keep alternating dry blotting with the soapy water solution until the stain is gone. You can also try ingredients like baking soda and hydrogen peroxide to help lift stains — just do a small test first for colorfastness. Wash all bedding regularly: This means human bedding and pet bedding! Regular washing helps mitigate any lingering odors and accidents you may have missed. Keep your dog active – before he comes in the house: This one is simple — a tired dog simply doesn’t get into as much trouble inside. 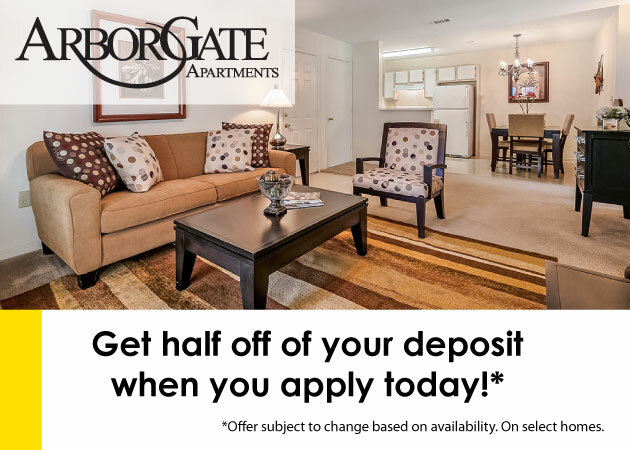 Some of our properties like Bella Ridge have on-site dog parks to make it easy on you! Have old towels handy for rainy days: New Orleans weather can be unpredictable, but you can pretty much count on rain. Keep old towels in a bin in the pantry so they’re at arm’s reach to quickly dry off a wet dog. You can also use the towels to cover up rugs or carpet so your wet dog can get from A to B without ruining anything! Avoid micro-suede and micro-fiber furniture: This furniture is more affordable, but it’s also a magnet for pet hair. If you’re able to afford a leather couch or chair, you’ll be rewarded with an easy-to-wipe-down surface that will last for years. Of course, you could also try (key word: try!) to not let your dog up on the furniture. A lot of helpful cleaning products are probably already inside your kitchen. Take a look at a few of our favorite products for a clean and happy home for you and your dog. Baking Soda: This grocery store staple is an affordable and effective way to remove odors. Sprinkle it on carpets before vacuuming, or add it to a spray bottle with water and a drop of essential oil, then spray in the air or on curtains and upholstery. Hydrogen Peroxide: Try pouring it on pet accidents (remember to test for colorfastness first) to help eliminate tough stains. Grooming Wipes: You can buy special wipes just for dogs, but good ol’ baby wipes will work, too. Keep a box by the front door, and wipe down your dog’s paws after every outing. Stain-resistant dog beds: Invest in a high-quality dog bed from brands like Crypton. Not only are the beds extremely durable and easy to wash, they also feature anti-microbial stain protection and a resistant fabric barrier that prevents germs from penetrating into the cushion. Roomba: These are expensive vacuums, no doubt. But they’re one of the most effective ways to win the war against dog fur. The vacuums run automatically, taking the burden completely off you. They also learn to get to know every nook and cranny of your home over time for a deeper clean than you ever thought possible. For even more pet tips, check out our Living With Pets section on the blog. When you have a dog, they’re part of the family — and just as you want the very best space for yourself and loved ones, you also want a space ideal for your four-legged friend. 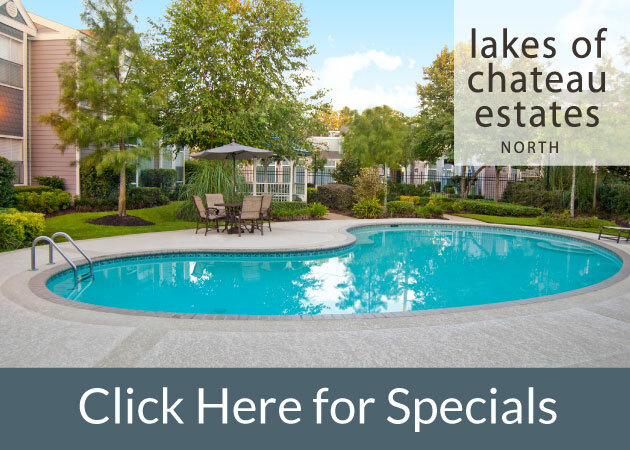 1st Lake Properties is a pet-friendly company with thousands of apartments ideal for dogs across Greater New Orleans. However, a few of our properties are especially suited to pups for their proximity to sprawling outdoor spaces like Lafreniere Park. Even better, Bella Ridge has a dog park called Bella Bark right on the premises that’s ideal for you and your dog. Learn more about our pet policies and best apartments for dogs in New Orleans below. How great would it be to have a dog park at arm’s length? That’s the reality at Bella Ridge, a luxury apartment community in River Ridge that’s thought of every last detail from oversized tubs to a dedicated space for your pet. The on-site dog park, Bella Bark, is a safe, convenient, well-lit place for dogs and owners alike to mingle and get some fresh air. It also features agility equipment to keep your dog fit while having fun. This exclusive dog park is available only for Bella Ridge residents — contact us today for specials! Several of our Metairie apartment communities like Sandpiper, Parktowne, Boardwalk, and Breakers are all just a short distance from Lafreniere Park. 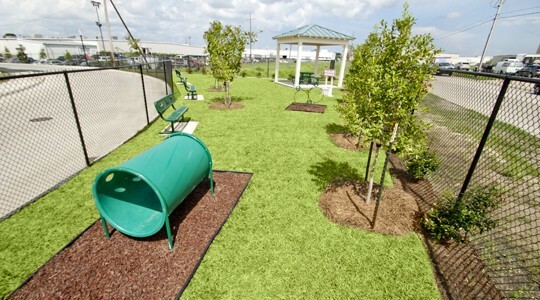 This sprawling green space in Metairie features a dog park called Bark Park, a 5-acre space just for pups. The park is open on Tuesdays through Sundays from 7 a.m. until dusk. On Mondays, the park opens at 1 p.m. and remains open through dusk. Separated into two sub-parks — one for large dogs and one for dogs under 22 pounds — Bark Park features agility courses and scenic views. Our pet deposit for one pet (20 pounds or less full grown) is $300, $100 of which is non-refundable. Following the deposit, 1st Lake charges a pet fee of $15 per month. If you have two pets, 1st Lake requires a $600 deposit, $100 of which is non-refundable. The monthly pet fee thereafter is $25 per month. All pets must be on leashes when walking around property grounds. For a list of restricted dog breeds, visit our Pet Policy blog post.